and Vincent Drucci in front of the Standard Oil Building, August 10, 1926. The so-called Battles of the Standard Oil Building in 1926 caused Lucky Luciano to dub Chicago, "A real goddam crazy place. Nobody's safe in the streets." The fact that the remarks were made by a visiting New York businessman, gangster Lucky Luciano, goes far to explain why and how the term Chicago gangster became world famous. In the first battle of Standard Oil, Hymie Weiss and Schemer Drucci, successors to the assassinated Dion O'Banion as leaders of the Irish North Side gang, were ambushed as they were about to enter the new 19-story building on South Michigan Avenue. 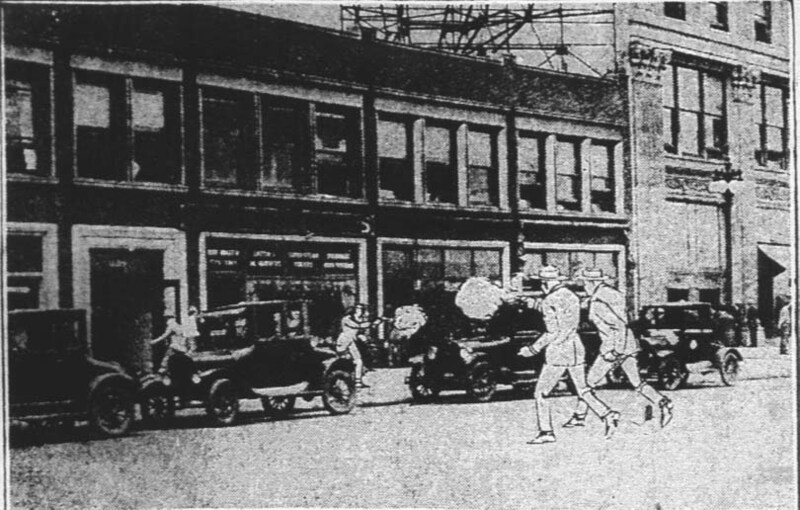 They were on their way to a bribe-paying meeting with Morris Eller, the political boss of the 20th Ward, who took care of protection for the mob's North Side speakeasies. Weiss and Drucci had just made it to the bronze Renaissance-style entrance when four gunners of the rival Capone Gang stormed out of a car and rushed them, guns drawn. Spotting the enemy, Weiss and Drucci dove for the safety of a parked car, and, drawing their guns from their shoulder holsters, started returning fire. The area was choked at the moment with morning rush hour pedestrians. One bystander went down in the first volley, while scores of other citizens either ducked for cover or else stood frozen in horror. Weiss wisely started to fall back, car to car, but Schemer Drucci, often referred to by Capone as "the bedbug," lived up to that sobriquet by charging right at his attackers. The frightened Capone gunmen backed off to a sedan parked on the other side of the avenue and then drove off, with a cursing Drucci firing after them. Drucci jumped on the running board of a passing car, jammed his weapon to the driver's temple and ordered, "Follow that goddam car." Just then a police flivver arrived, and officers wrestled the crazed Drucci to the pavement. Questioned by police, Drucci denied there was any gang battle at all, just a case of some punks "trying for my roll"; he flashed a roll of $13,500. The cops brought in Louis Barko, a Capone hood, who had been recognized as one of the gunners, but Drucci followed the underworld code and said, "I never seen him before." Barko and several other suspects were released. None of the ensuing publicity convinced either gang that they did not have more right to the area than the citizens of Chicago. On August 15, five days after the first battle, Weiss and Drucci were again attacked at virtually the same spot. They were driving in a sedan when gangsters in another car blazed away at them. The North Sider's car was riddled with bullets, but miraculously neither Weiss nor Drucci was hit. They jumped from their car and made it to the sanctuary of the Standard Oil Building, firing back over their shoulders. On September 20, the O'Banion Gang made a famous counterattack by striking at the Capone headquarters at the Hawthorne Inn in Cicero. A convoy of eight cars filled with gunmen drove slowly past the establishment, and unloaded an estimated 1,000 slugs in an unsuccessful effort to kill Al Capone. All they managed to do was nick a few pedestrians and hit Louis Barko in the shoulder inside the Hawthorne Inn. Later, the police arrested Drucci on suspicion that he had fired the shots that downed Barko. Barko, commenting on Drucci, said, "Never saw him before." Apparently he didn't even remember being brought before Drucci after the first Standard Oil shootout. The outrage about the shootings was enormous, but nothing much came of it all. One sage said that somebody should have at least been saddled with a good stiff fine. But then again this was Chicago, "a goddam crazy place."